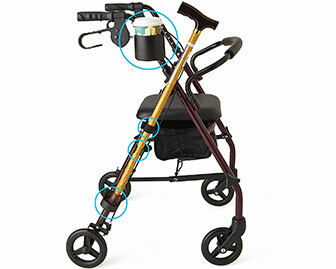 An accessory that attaches to a walker to hold a cup and/or cane. Great for people that sometimes need to access areas where only a cane cannot be used ie. through narrow doorways. Also helps to hold one’s beverage, leaving one’s hands free to use the walker or brace oneself against a fall.